Collaborating with Carly last fall was nothing short of amazing. The veil always seemed to open wide in her presence… for better or worse. On the up side, we received all sorts glimpses into the “shadow world” that surrounds the Earth like a blanket of spiritual residue… and my mind kept stretching a little more each time she sent me a new collection of the photos she’d taken in her stables or in her back yard. Some of the many fantastic glimpses into the other side that Carly captured with her camera. On the down side, Carly suffered various physical disorders as spirits moved in and out of her life. I even got a first-hand feel for those spiritual forces during a bout with the flu last November. I was hoping that the open veil or portal in Carly’s life would lend itself to an ITC bridge (that is, heightened communications from the spirit world through our radios, computers, phones, and other equipment)… but Carly felt herself being drawn to a wider range of shamanic work, which could involve skills for healing, channeling, ITC, prophecy, UFO research, and more. The four wheels looked like gold-colored, sparkling beryl or topaz. Each gleaming wheel was identical in form to the others, and they appeared to have been constructed and designed as a wheel within a wheel. This is an artists depiction of Ezekiel’s description. Click photo for source: bibliotecapleyades. 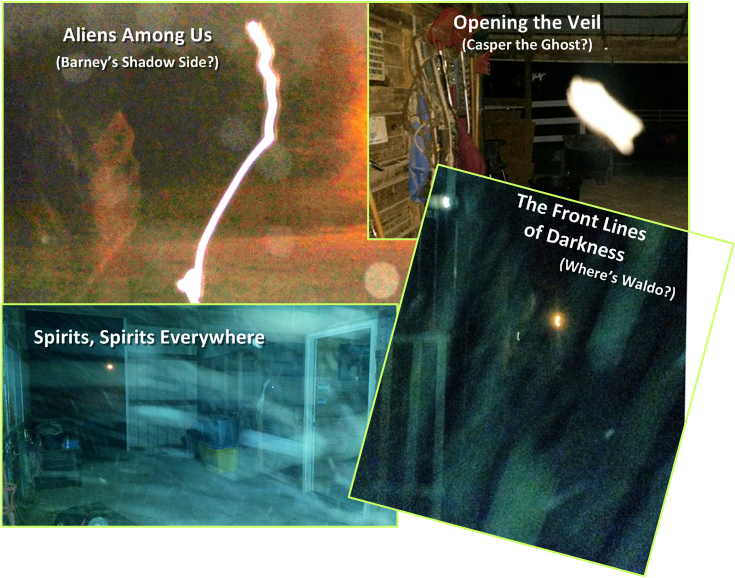 This entry was posted in Uncategorized and tagged ETs on film, ezekiel lights in the sky, shamanism, spirits on film. Bookmark the permalink. I enjoyed this reading, as well as the last 2 writings in particular. There were many comments that I wanted to register about the last 2 postings, but failed to do so. It is now Onward into the moment. Keep up the valuable writings!